With all of the rain and clouds covering much of California lately, I was reminded of this image that I shot last June in Lake Tahoe. I had been helping a friend paint his house in Sacramento over that weekend and since I didn’t have to be anywhere on Monday, I figured I would go the rest of the way up to the lake so that I could relax and shoot a little. Since it was hot and I wasn’t really paying attention to the forecast, I didn’t know that the weekend’s awesome, sunny weather was going to turn to crap as soon as I hit the Sierras. I spent a whole day driving around the lake while the rain poured only to stop occasionally as there was a break in the weather to grab a shot here and there. HDR Info: Three images shot on a tripod with my Canon 40D through a Sigma 10-20mm lens at 20mm/f8.0 with ISO 200 at a base exposure of 1/100. 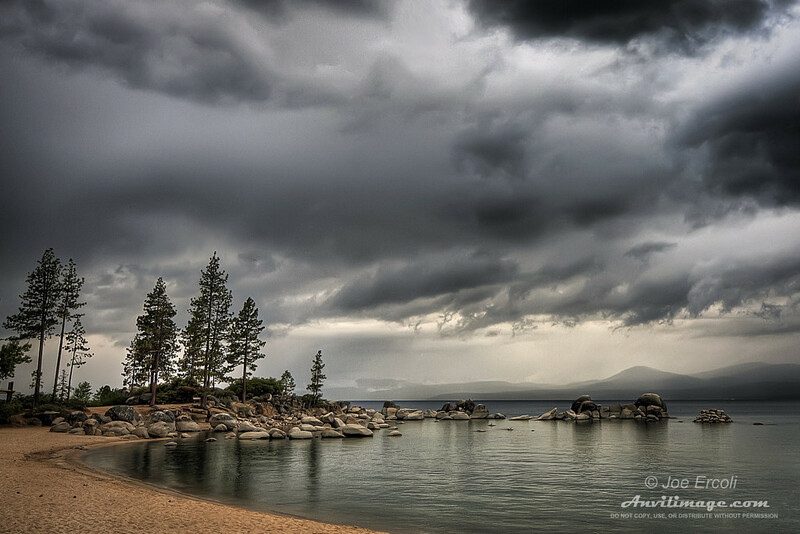 This entry was posted on Friday, February 12th, 2010 at 2:45 pm	and is filed under Blog, Photos and tagged with clouds, lake, Lake Tahoe, reflection, storm, water. You can follow any responses to this entry through the RSS 2.0 feed.